In this article, I will cover 3 free websites to extract RPM file online. RPM stands for Red-hat Package Manager. It is a package management system for Linux distributions. The file format for Red-hat Package Manager is .rpm itself which can contain an arbitrary set of files. Sometimes you might need to access the files within the package for development or other purposes. In such cases, you can extract the RPM file to access the content inside it. With the 3 online file extractor websites covered in this article, you can easily extract the content of a .rpm file online. These websites are absolutely free to use. You can simply upload your .rpm file to extract all the files inside and download them all as a ZIP. All these websites support password protected compressed file as well. So, let’s check out these websites one by one. Extract.me is a free online archive extractor tool where you can extract various compressed file types. This website supports over 70 types of compressed file types including rpm, dmg, exe, msi, iso, cab, zipx, tar, and more. To extract the content of a file, you can either upload a file from your system or fetch one from Google Drive or Dropbox. You can load a file from the web via URL as well. There is no maximum file size limit mention on this website. If the file you are extracting is password protected, this tool gives you a popup to enter the password to extract the file. In the results, it extracts all the content from the .rmp file which you can download to your system altogether as a regular .zip file. This tool also generates a .cpio file along with the ZIP which is also downloadable. Extract RPM file online here. The next website to extract RPM file online on this list is Online.B1.org. 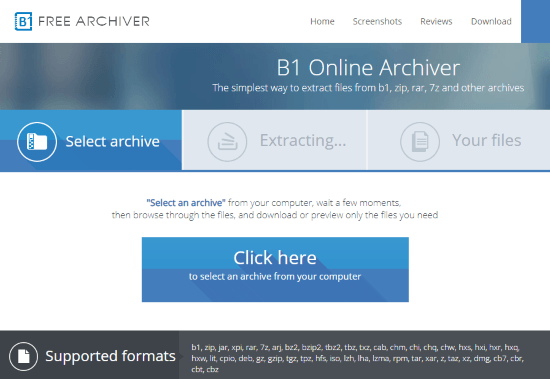 This website offers a free online archive extractor tool that supports dozens of compressed file types including rpm, cab, chm, cpio, gz, tar, z, dmg, cbr, tgz, tar, and many more. This tool also doesn’t have any maximum file size limitation. You can simply upload your file here for extraction. Depending on your file size, it will take a few seconds to minutes to extract the content of the file. In case of password protected file, it asks you for the password upon upload. In the results, it shows you all the extracted content. You can browse through the context and download any particular file separately. This tool automatically deletes your files within a few minutes after extraction. It also gives you an option to manually delete all your files. Give this online RPM file extractor a try here. WobZip.org is another free website to extract various types of files online. On this website, you can easily extract rpm, arj, cpio, deb, dmg, fat, hfs, mbr, ntfs, xar, and many more types of compressed files which are under 200 MB in size. You can either upload a file from your computer or fetch one from the web by entering a URL. This website also gives you an option for the password. In case of a password protected file, type the password after uploading the file and click “Uncompress” button to extract its content. Depending on your file size, it takes a few seconds to uncompress your file and gives you all its data packed in a ZIP file. 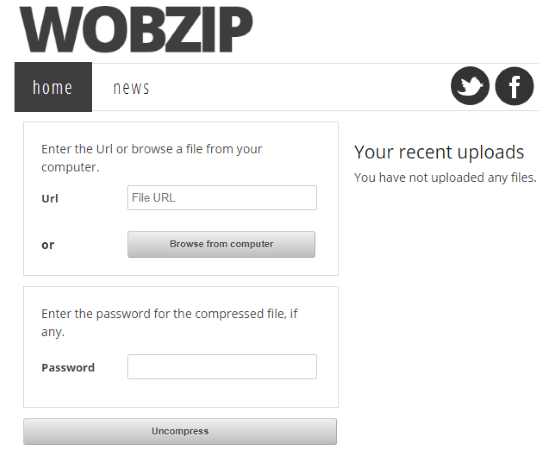 You can extract RPM file online with WobZip here. These are the 3 online RPM extractor websites where you can access the content of a .rpm file. I personally prefer Extract.me because of no size limitation and support for cloud import. Give them a try yourself and let us know which one you prefer and why.